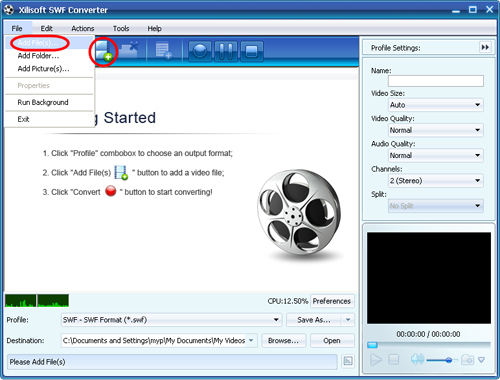 The following guide will show you how to convert SWF videos from other popular video files with Xilisoft SWF Converter step by step. First, please download, install and run Xilisoft SWF Converter. Then, the main window of the program appears as below. If choosing "SWF+HTML" profile, you can create a HTML page with embedded SWF file to play it with the Internet browser directly. If you want to do more with the video, just go ahead. Otherwise jump to Step 6 to complete the conversion directly. Highlight the file and click the "Add Profile" button on the toolbar to add one extra profile below the selected file, and select output format from the "Profile" drop-down list. In this way, you can get several files with same content but different extension converted with just one click. 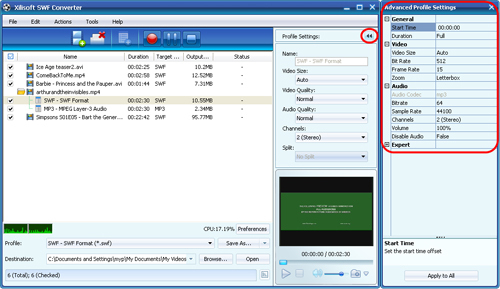 On the right general and advanced "Profile Settings" panels, you can adjust the output SWF file parameters, like Name, Video codec, resolution, bit rate, frame rate, video quality, audio quality, audio channel and so on. 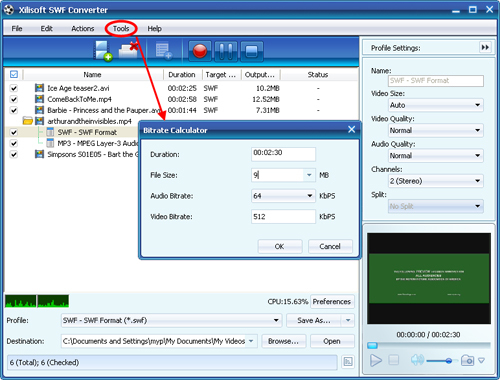 To customize the output SWF file size, highlight the source file, click "Tools > Bitrate Calculator", and type the file size you want in the "File Size" textbox, then the video bit rate will be auto-calculated directly. Click "OK" button, and the value you type will be shown in the "Output Size" column of the file list. 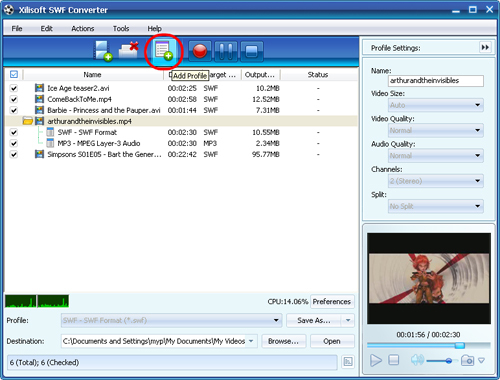 After all the above settings are OK, click "Convert" button to start converting your videos to SWF files in batches. You can pause, resume, or stop during the conversion process. 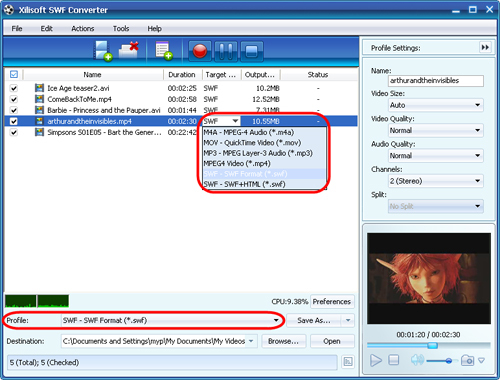 If the output SWF file exceeds 16000 frames (the frame limit on SWF file), This SWF Converter will auto-split it into several parts to avoid the halt during SWF file playback.